Carmichael Lynch put together a very bold and clever advertising campaign for Subaru, and it features a photograph that I took of my very own Subaru Outback after I ran it headlong into a boulder going 60 mph. I walked away relatively unscathed, but the car wasn’t so lucky. This Subaru was 1 of 5 that I have thus far owned in my lifetime. The reasons why I walked away from the accident has much to do with my predilection. When I bought my first one it was for the All-Wheel-Drive and good gas mileage. I would later discover other positive attributes, along with the company’s attention to manufacturing efficiencies and the environment. With the “Dear Subaru” campaign, Subaru is counting on there being more people like me who have a story to tell. It doesn’t have to be an accident like mine, but anything that demonstrates your affinity for driving their vehicles and the places they take you. Carmichael Lynch and Subaru are pursuing a multi-channel marketing strategy with targeted ad buys in various publications, signage in dealerships, digital media, and I suspect some outdoor as well. 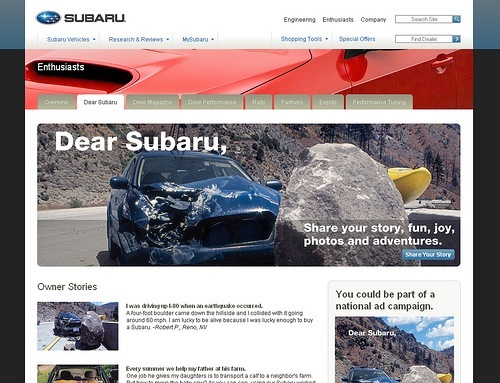 The “Dear Subaru” imagery and messaging is all tailored to encourage conversation about the Subaru brand. People share their stories on the Web, but is so often the case conversations extend from online to offline as well as the reciprocal. It is a clever strategy, and I look forward to seeing how the campaign performs. 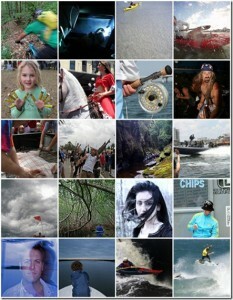 If you see one of the ads featuring my photo and story please tear it out, take a photo, or forwarded it to me online. I would appreciate it!